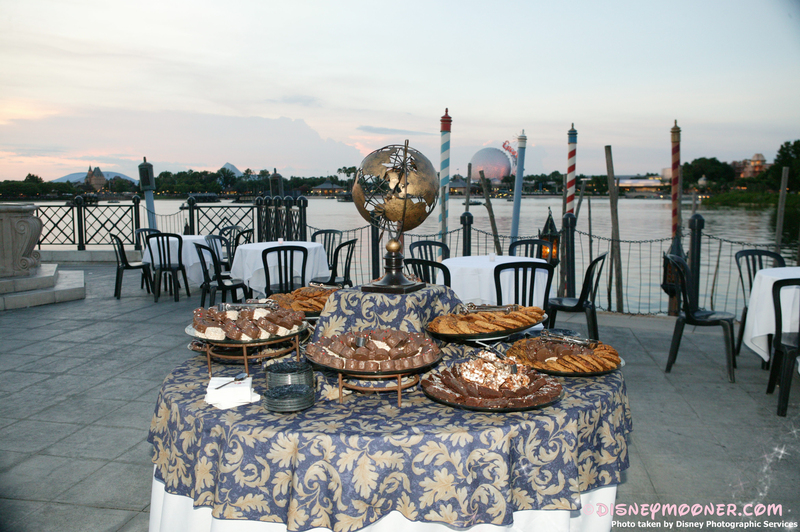 Illuminations Dessert Party: Is it worth it? 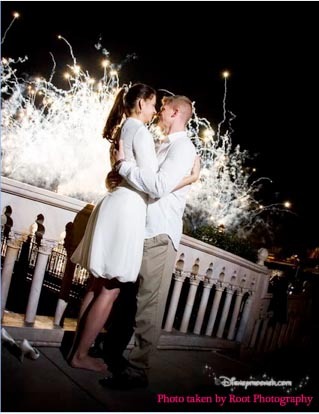 Thanks to one of our biggest blog contributors here on yourfairytalewedding.com, Living Seas Bride, who talks discusses her thoughts on having an Illuminations Dessert Party. 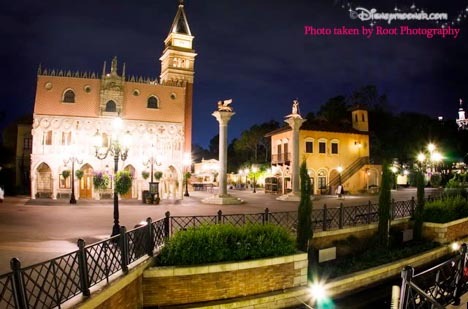 When we planned out Disney Fairy Tale Wedding in 2006, we knew three definite things. 2 We were having characters are the reception. In fact, above all else, I was willing to cut corners on floral and decor if it meant having that special moment. 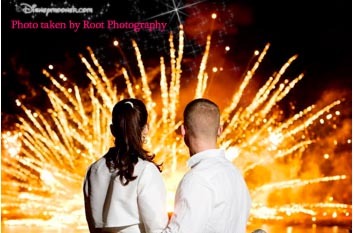 I had seen countless other brides have those amazing fireworks images and I was certain to have them. Many couples struggle with the question when a budget is in mind: Is it worth it? To be able to see the look of awe in the eyes of the youngest to the oldest made the cost worth every penny. 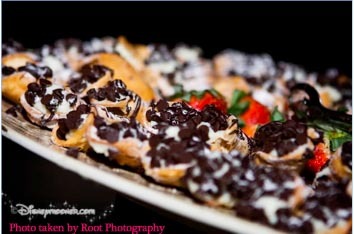 The desserts and view alone are enough to convince anyone who can budget it in, to go for it! 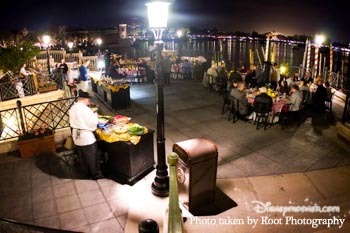 I remember leaving my reception and being so excited to experience one more part of the magic with my guests. And the view………well it is next to none. I have never had a better view of Illuminations in my life. The pictures can do the talking. 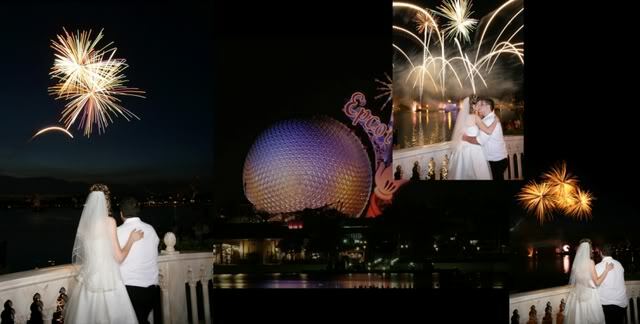 When we started planning our Disney Wedding, I was overwhelmed with all the amazing venues and options we had. 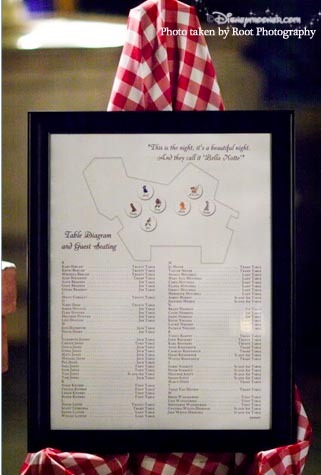 I knew I wanted our wedding to be a once-in-a-lifetime event both for us and our guests. 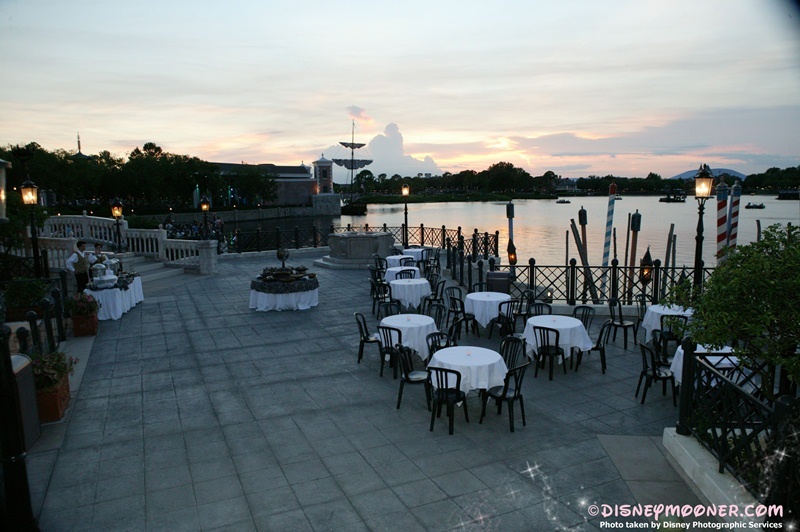 Initially, I was hoping for a morning ceremony, followed by a brunch reception and an IllumiNations dessert party later that night. 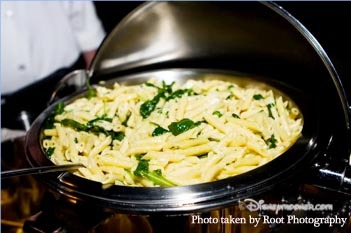 I fell in love with the idea of an event at Italy Isola, the “island” in front of the Italy Pavilion in Epcot’s World Showcase. Unfortunately, the location was booked for the evening of our wedding date, which was MLK, Jr. Day in 2009. 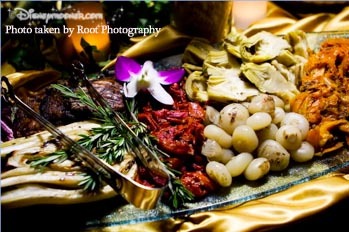 Our Coordinator suggested hosting an event there the night before the wedding, and the more I thought about it, the more I liked it! We decided to call it a “Welcome Dinner” instead of a rehearsal dinner, since all of our guests were either family, in the wedding party, or from out-of-town. This gave us all the opportunity to spend time together before the big day. 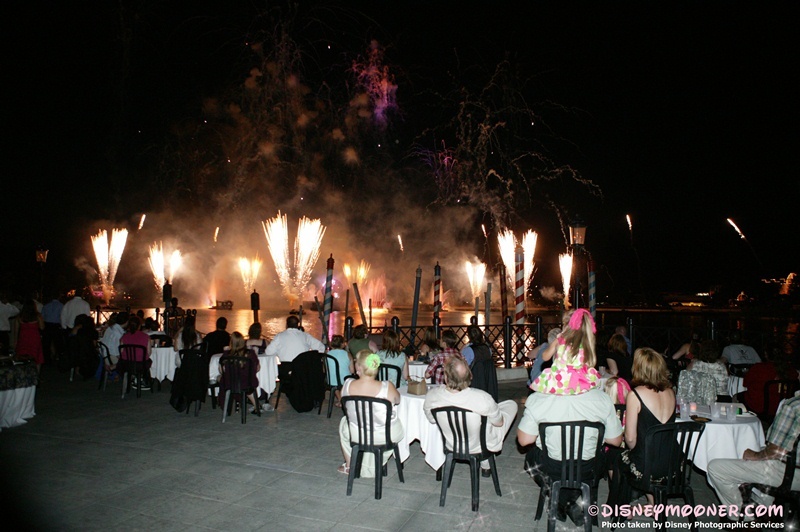 Plus, the drama of IllumiNations combined with the VIP treatment of a private dinner on Italy Isola certainly set the stage for how unique our wedding would be. Surprisingly, a simple dinner buffet was not four times the cost of a dessert buffet, as I had initially thought. 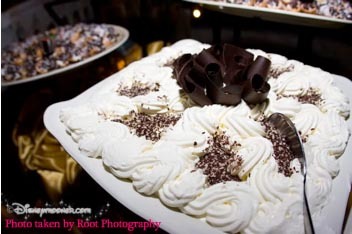 True, you can have a fairly inexpensive dessert buffet, but by the time I had added all the “extras” I HAD to have, our dessert party would have been only $15 or so p.p. less than the dinner buffet we selected, which included dessert! 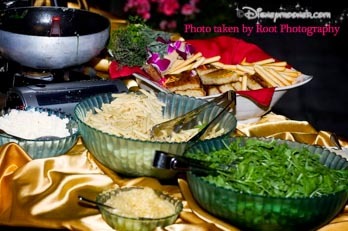 Because it was set in Italy, and because I love “Lady and the Tramp,” we went with an Italian theme, complete with the Lady and the Tramp buffet that Epcot catering offered at the time. We also opted to do B.O.C. (bill on consumption) for alcohol and drinks (which we also chose for the wedding) and it saved us a bundle. The event happens so quickly, and folks spend so much time either visiting or watching the fireworks, that drinks are not consumed as quickly as you might imagine. 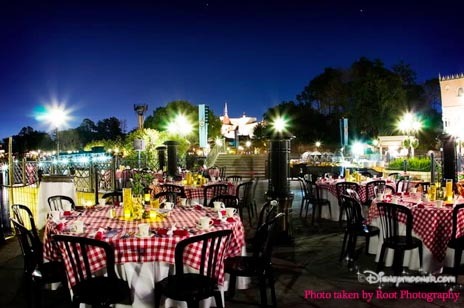 Keeping with the Italian theme, we used Epcot’s black plastic tables and chairs, but had Disney Floral cover the tables with red and white checkered table cloths and an assortment of dried pasta and lanterns for centerpieces. 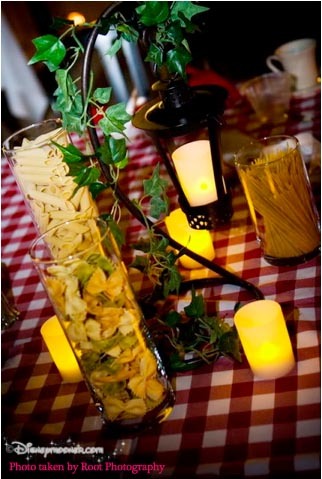 While I think the effect was perfect, I’m sure a simpler table setting would not have taken away from the beauty of the event. 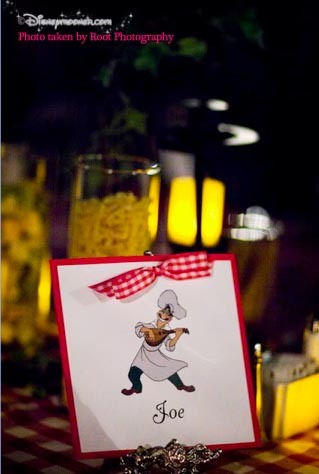 We also worked with Shelley from Impressions to complete a seating chart, table names and menus…with a Lady and the Tramp theme, of course. The only chink in the armor was that the day of the event proved to be a chilly one! It was January 18th, and it was in the 50s that evening. After a few discussions with our planner, we decided to add heaters to the event. 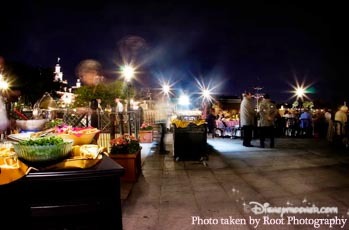 This proved to be expensive, but our other option was to move the dinner indoors (possibly to the American Adventure Parlor on the second floor of the AA building), and then move outside for the fireworks. 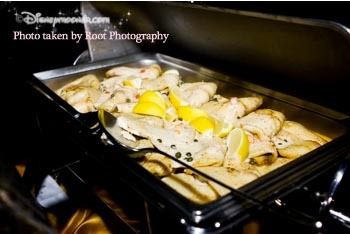 I was against that, due to the planning we had put into having a cohesive event. In the end, it might have been a smarter choice, as we were all pretty chilly. So, if you’re having an event in January or February, be prepared for the weather to interfere! 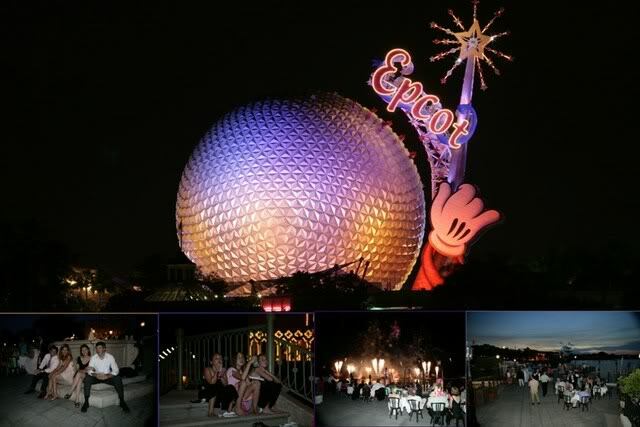 As with everything else in Epcot, your guests must arrive by bus (or have a park ticket). And despite our numerous reminders about the bus times and locations, my father-in-law and his wife missed the bus, because “someone told [them] they had to have park tickets to get into Epcot and come through the front gate.” Ugh. 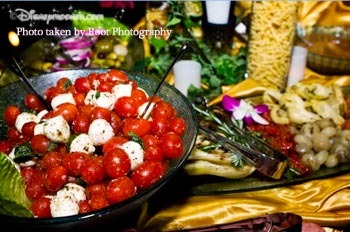 So, be prepared to address these concerns in numerous ways to get the message across for your guests. 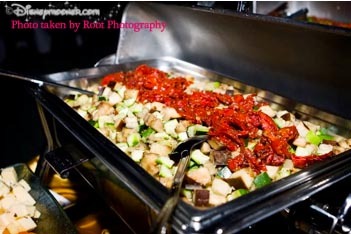 Nonetheless, everything looked and (mostly) tasted fabulous. 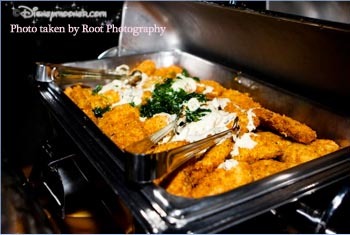 The food was quite a spread! The only negative was that the “tiramisu” was more like a mousse than an actual tiramisu, so avoid that if you can! As well as cannoli and the offending tiramisu for dessert. 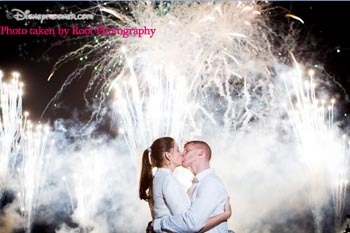 It was a fabulous way to kick off our wedding, and our guests are still talking about it 3 1/2 years later!